Many investors like to keep some gold in their investment portfolio — “just in case”. This may be especially true now, considering recent geopolitical strife — which is about as acute as it has been in a long time. However, in our view, adjusting your portfolio allocations based on what you read in the newspapers and see in the nightly news is, more often than not, incomplete information that leads to poor investment decisions. We prefer to look at the price of an asset relative to its historical norms, and investor asset flows as they pertain to those prices — the latter which indicates where real money is being deployed. This information, plus some additional quantitative metrics we use to further measure investor fear and greed, provide a much more complete, unbiased, and data-driven indication of what is really going on in a given market. And, for gold, these metrics are currently flashing some significant warning signs. Gold Resuming Its 2011 Decline? Chart 1 below plots gold futures weekly since 2011. It shows that prices declined by 45% from the September 2011 benchmark high into the December 2015 low, but have since been drifting sideways in non-trending investor indecision. That is, up until the past week or so. The rightmost red highlights show that gold prices are now edging below the lower boundary of this 30-month indecision area, which suggests the larger 2011 decline is resuming. If this emerging breakdown below the lower boundary of this indecision area at $1257 per ounce holds, it would target an eventual, additional 21% decline to $975. 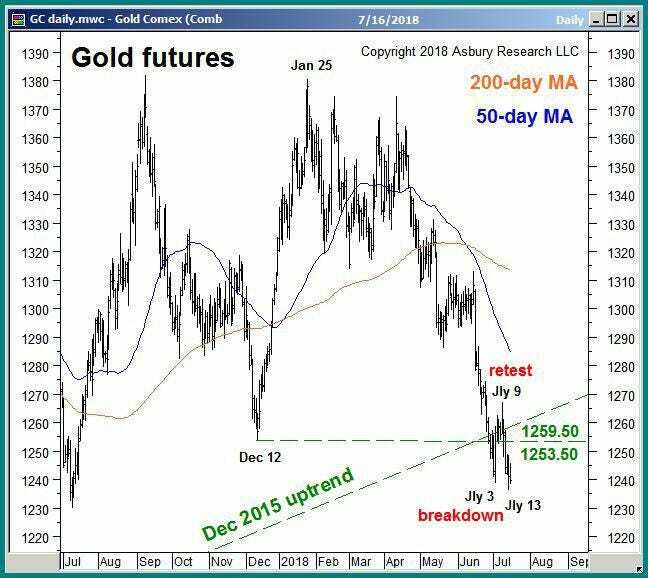 Chart 2 below takes a closer look at gold futures via a daily chart over the past year. The red highlights show that a band of underlying support at $1259.50 to $1253.50 per ounce, which represents the December 2017 benchmark low and December 2015 uptrend line, was initially broken into the July lows, was retested as overhead resistance on July 9th, and has since declined this week to fresh lows. This series of events indicates that the market “sees” this major support area and — at least so far — is reacting to it in a negative way. 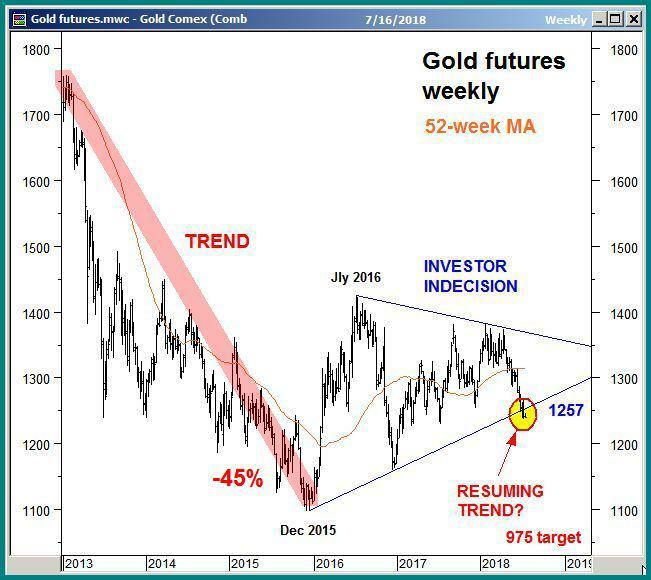 As long as the $1253.50 to $1259.50 area now contains prices on the upside, our new intermediate term negative outlook on gold prices will remain intact. Chart 3 below plots the SPDR Gold Trust ETF (GLD) daily since Q4 2015. The red highlights show that GLD is also declining below its December 2015 trend line, which corroborates the weakness we are seeing in the futures market. 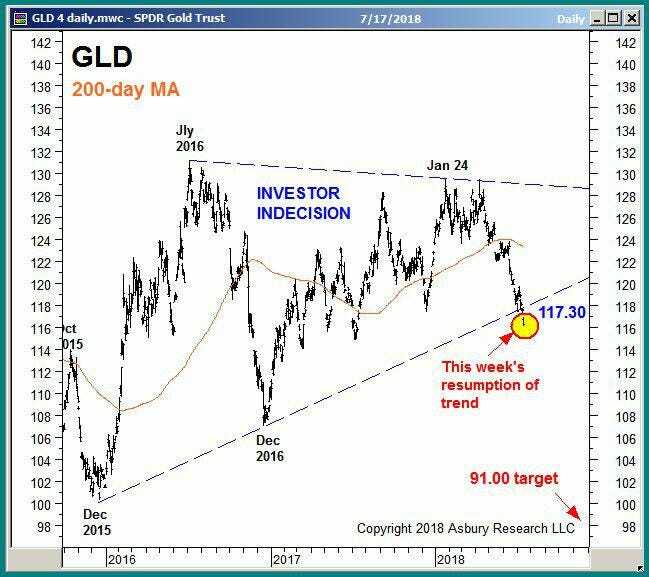 This breakdown in GLD targets an eventual, additional 22% decline to 91.00 that will remain valid as long as the lower boundary of its investor indecision area at 117.30 now loosely contains prices on the upside as overhead resistance. 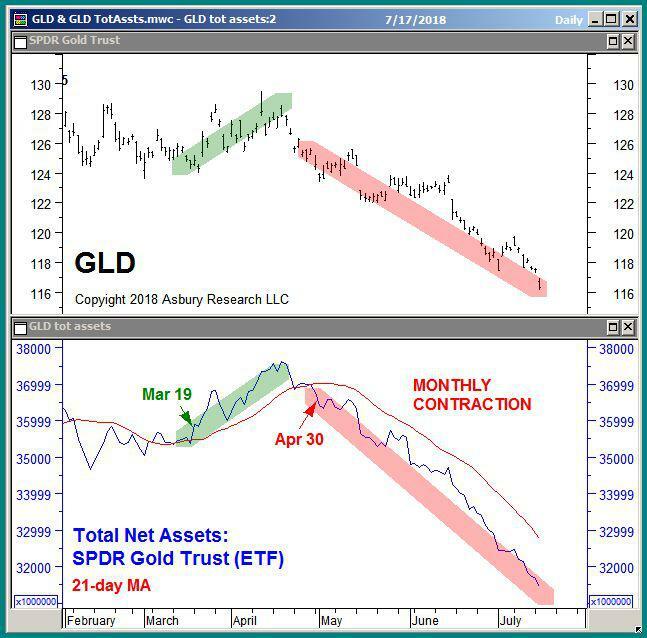 The blue line in the lower panel of Chart 4 below plots the daily total net assets invested in GLD since February along with their 21-day moving average, the latter which we use to identify a monthly (our tactical time period) trend of expansion or contraction. A corresponding daily chart of GLD is plotted in the upper panel. Think of these asset flows as “trend fuel”. Expanding assets indicate near term bullish conviction in higher prices, while contracting assets indicate a lack of bullish conviction. The red highlights identify a trend of monthly contraction that has existed since April 30th, which has triggered and fueled the current decline in the ETF and in the gold prices it emulates. You can also view the article on Forbes.com. John Kosar CMT is Chief Market Strategist at Asbury Research LLC, an independent provider of technical and quantitative financial market research to professional and individual investors. John is also a Managing Principal at Asbury Investment Management LLC, which offers professionally managed accounts driven by Asbury Research investment ideas.